Billy Budd, opera, Op. 50: Look!... Through the port comes the moonshine astray! Antonin Dvorák; Benjamin Britten; Camille Saint-Saëns; Charles Gounod; Claudio Monteverdi; Gaetano Donizetti;... Fine. In fine packaging. Simply the Best: Night at the Opera. 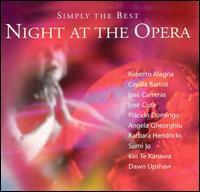 Antonin Dvorák; Benjamin Britten; Camille Saint-Saëns; Charles Gounod; Claudio Monteverdi; Gaetano Donizetti;... Very Good. In very good packaging. Simply the Best: Night at the Opera. Very Good. CD's In excellent condition! Almost like new, case has light rubbing. FREE UPGRADE TO FIRST CLASS SHIPPING. Very Good. Very Good condition. Audio CD. Case Good. Case scuffed. Quality guaranteed! In original artwork/packaging unless otherwise noted.